Banipal dedicated its latest issue entirely to the celebrated Syrian short-story writer. Since 1957, Tamer has published eleven short-story collections, children’s books, and satirical articles. He has been a freelance journalist as well as the editor of many famous newspapers and journals including Al-Quds Al-Arabi and Al-Mawqif Al-Adabi. 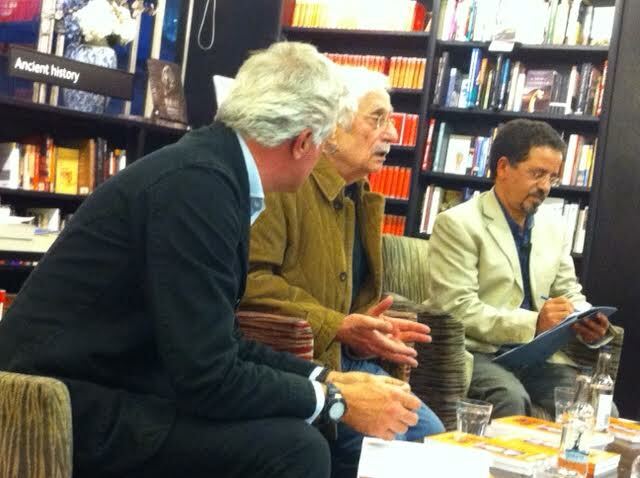 He is also one of the founders of the Arab Writers Union, established in Syria in 1969. Journalist Paul Blezard, who presented the event, called Zakaria “Tamer Untamed,” hinting at the fact that the artist, despite his venerable age, has not loosened his grip on the public imagination. Zakaria Tamer has always been a great opponent of tyranny, and this is what many of his stories are famous for, but the author has also been very critical of Syrian society and of human folly in general. Those who know the history of Syria will find Zakaria’s stories more relevant today than ever. Six of his stories were read at the event, including: “The Earth is Ours, the Sky belongs to the Birds,” “Why Did the River Stop Talking” and “The Promotion of Folly.” Tamer’s stories were pertinent in the 60s and still are. “A well-written story,” he said, “will be aware of time.” He was grateful that his literature had survived the test of time. Short stories, as opposed to novels, seem to be the literary form most apt at conveying Zakaria Tamer’s ideas. Although he has mastered the short story form, Tamer admits that he still feels like a farmer who has only begun to work his first patch of land. He is not a big fan of Arab novels, and believes that concepts could be better articulated in the short story. The latter is a more complicated form to perfect in his view. There is a country that has baffled historians. Every time one of its rulers becomes convinced that he will occupy his throne for ever, he flies from his palace to his grave like the flight of eagles and hawks, and no one walks in his funeral procession save his envied killer. One can’t avoid noticing how Tamer shunts you through puzzlement, a fairy-tale story of kings and palaces, then it nosedives from a position of power straight to the grave, leaving you with the disturbing image of a killer, and yet aren’t hawks and eagles symbols of royalty and birds of prey? Despite living in the UK since the 1980s, Tamer seems to have grasped the roots of the current situation in Syria. The author was almost in tears when he explained what made him choose voluntary exile. He used to live in Rawda Street, Damascus. One day, there was an explosion. A security officer had blown himself up. As Zakaria left the building, he found parts of his body scattered in the street, and children were kicking them like a football. At that moment, he decided that Syria was no longer home. Since 2012, he has been writing posts on his Facebook page, “Al-Mihmaz” (The Spur), with such consistency that all his comments, if put together, could make a three- to four-hundred page book. He commented that a person who reads his posts will probably think that he never left Syria. Tamer is adamant that “The Arab Syrian Army is the first danger for Syria and the enemy number two is the President.” This, in spite of the current focus on ISIS. In his opinion, Arabic literature is translated not because it’s good, but because it introduces the readers to the Arab world, almost as if those books were just tourist guides. As he says, the idea is that, “If you want to know Syria, read this story! This is wrong.” Tamer does not want to be a business card to Syria. And yet, despite the fact that he merges reality and surrealism and you rarely find references to Syrian toponyms, you can’t help equate Syria with Tamer. A glance at Tamer’s work will make you think that he is disillusioned about many aspects of life, but actually Tamer considers himself as straddling both hope and despair. The proof is the perseverance he has demonstrated throughout his life as man of art. Although he was compelled to write for government newspapers, because there was no alternative in Syria, he has always tried to convey his message. One of his victories came in the Eighties, when he was dismissed from his job at al-Ma’rifa, a magazine published by the Syrian Ministry of Culture. One specific article was found to be too daring by President Hafez al-Asad, so the intelligence services raided Zakaria’s house. Luckily he was not at home. Warned by his wife, he escaped to Lebanon. All the copies where his article appeared were confiscated from the shops. But what they found in the shops was a very small number compared to the thousands that al-Ma’rifa had managed to sell. Although he feels completely free to talk about “forbidden topics,” he is also aware that there is no immunity for writers, not even for writers as prominent as him. Also, many of his stories do not have a happy ending, almost as to show his disillusion towards some aspects of life. Zakaria Tamer is still very active in his writing. He has just published a collection of satirical essays, The Land of Misery and has announced the publication of his forthcoming anthology. I don’t know, I read it as a digital copy. I like his quote on books being translated for likeness to tourist guides, rather than for being good and worthy of reaching a broader audience. Ideally a good book does both: introduces a reader to something new and tickles minds and imaginations with excellent plot and craft. 0=554Look here,,,,!my co-worker’s step-aunt makes $79 an hour on the computer. She has been out of a job for 9 months but last month her pay was $17477 just working on the computer for a few hours.